EpiPen maker Mylan’s CEO’s connection to the National Association of State Boards of Education may be a part of the shady dealings being investigated by US lawmakers, including allegations that they defrauded West Virginia’s Medicaid department. Mylan has been highly scrutinized after increasing the price of its medical devices that fight life-threatening allergic reactions by 400 percent this year. The pharmaceutical company is now facing an enforcement action after not cooperating with the West Virginia attorney general’s subpoena issued last month, CNBC reported. Heather Bresch is the CEO of Mylan and is reportedly very well connected. The daughter of a former West Virginia governor and current US Senator Joe Manchin (D) is facing accusations that she used her mother Gayle’s position on the National Association of State Boards of Education to boost her company’s earnings. Gayle Manchin must have seemed to be very passionate about allergies when she was at the forefront of a movement to require schools to purchase EpiPens in 2012. Eleven states wrote laws requiring the powerful allergies-reversing medicine, and almost all of the remaining states strongly encouraged schools to keep epinephrine auto-injectors on hand in case of an emergency. The rapid interest in allergic reactions went all the way to the White House, where in 2013, President Barack Obama signed the EpiPen Law that gave preferential funding to states that encouraged EpiPens. Meanwhile, the cost of EpiPens was increasing. In 2007, two EpiPens, the common dosage for a year, cost $100. It is around this time that EpiPen prices began increasing by 30 percent each year, according to Fortune. By the time 2012 rolled around, they were over $200 for a two-pack. While prices increased, so too did Bresch’s paycheck. From 2007 to 2015, she went from being paid $2,452,456 to $18,931,068 – a 600 percent increase, according to CNBC. That isn’t to say that all of the increased presence of EpiPens is due to Manchin’s relation to Bresch – if there is even a relationship between the call for more EpiPens and Manchin assuming the role as head of National Association of State Boards of Education in 2012. Starting in 2008, Mylan began pouring more money into its lobbying campaigns and increased their budget from $270,000 to $1.2 million according to the Center for Responsive Politics. In 2012, their lobbying budget reached a peak of $1.79 million. The mother-daughter bond over passions for epinephrine auto-injectors aside, Mylan could still be in trouble for issues in West Virginia. 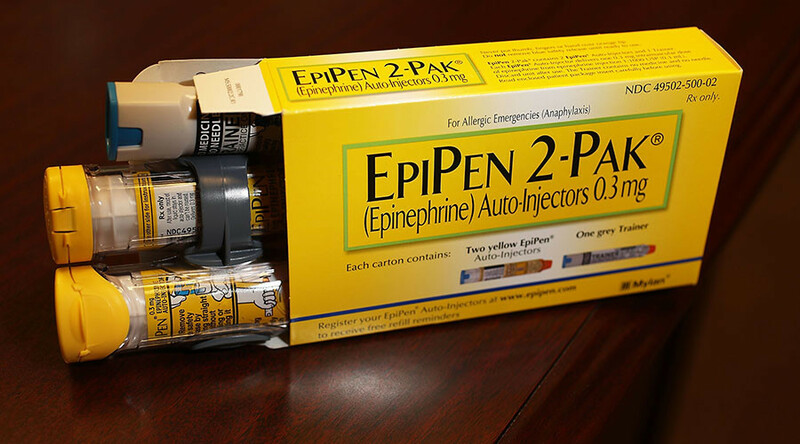 The state’s senate Republicans are demanding a probe into the company’s rebates amid concerns that EpiPens were misclassified as generic drugs in order to game the rebate system for manufacturers of single source drugs, branded drugs and generic drugs. Currently, generic drugs and their ilk provide rebates starting at 13 percent, while brand name drugs have to pay rebates of 23.1 percent, Business Insider reported. These rebates slightly offset the cost of expensive pharmaceuticals, as last year Medicaid spent $42.7 billion on drugs and received manufacturer rebates of $19.9 million. In addition, analysis from the Henry J. Kaiser Family Foundation found that Medicare Part D spending on EpiPens had increased from $7 million in 2007 to $86.9 million in 2014, marking an 1,151 percent increase. However, Part D EpiPen users only grew by 164 percent. If these accusations are true, they wouldn’t mark the first time Mylan has been punished for misclassifying drugs. In 2009, the company paid a $124 million fine for misclassifying its drugs and underpaying rebates. An interesting twist in EpiPen’s classification as a generic drug is that Mylan has attempted to fight public scrutiny over their price hike, by making an authorized generic version of the EpiPen that would be half as expensive.